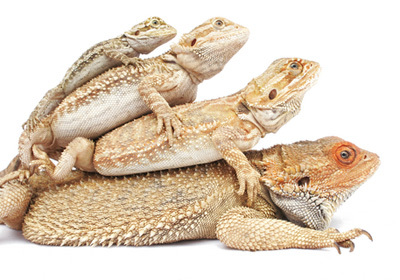 What do I need for my pet bearded dragon? You want a bearded dragon and want to make sure it receives proper care. To do this you must have everything needed before you bring your new pet home. Below is a list of all the items to keep your new dragon happy and healthy. A large aquarium or terrarium with a screened top. Get as big a cage as possible. A combination light fixture that supports fluorescent and incandescent lights. A UVB fluorescent bulb. A good choice is the ZooMed Reptisun 5.0 fluorescent bulb. A daylight bulb or heat emitter. An under tank heat pad. Substrate for the bottom of the tank. A hiding area for your bearded dragon. Rocks, branches, or logs for climbing and basking. Food bowl, smooth insect bowl, and a water dish. Any additional decorations, backgrounds, or artificial plants to make the habitat look more natural. Crickets, mealworms or superworms that have been gut loaded. Frozen mixed vegetables: beans, carrots, peas. Fresh vegetables: carrots, mustard, collared, dandelion greens, or kale. Calcium & vitamin D3 supplement powder.